For anyone who is going to tackle a decorating project on their own (and yes, it can be done) organization is KEY! If you’re a Virgo, you have a built-in advantage in your nature. The ideas here are to be organized, and to keep everything in one place. The first things you’ll put in here are Inspiration Images. These are photos of furnishings and items that you like. You can find these images in magazines, catalogs and online. Whenever you see something you love, add the photo to your project file. Once you have a lot of images, you can narrow things down and see which items coordinate with each other. This is also a great place for all your Paint Samples. Again, you’ll start off with a lot and narrow down to the ones you end up using. Paint samples are great to keep for reference later on. Fabric Swatches for your upholstery and window treatments can go in another pocket. 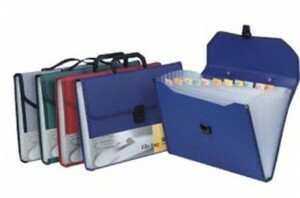 A very very good idea when going shopping is to take the project file with you! This is because all your samples are here, and if you see something you like in a store, you will know if it goes with the paint and fabric you have already chosen! When you buy furnishings and accessories, add your Purchase Orders, Receipts and Warranties to your file. Just in case something goes wrong, you’ll have everything at your fingertips. If you are hiring a contractor, painter, handyman or anyone else to help you with the work on your home, keep a copy of the Agreement or Contract in your folder for easy reference. Home renovation can be a very involved process. Your Project File will make it a lot easier for you to keep everything accessible and in one place! Trust me… you’ll thank yourself! This entry was posted in Tackling your Project. Bookmark the permalink.